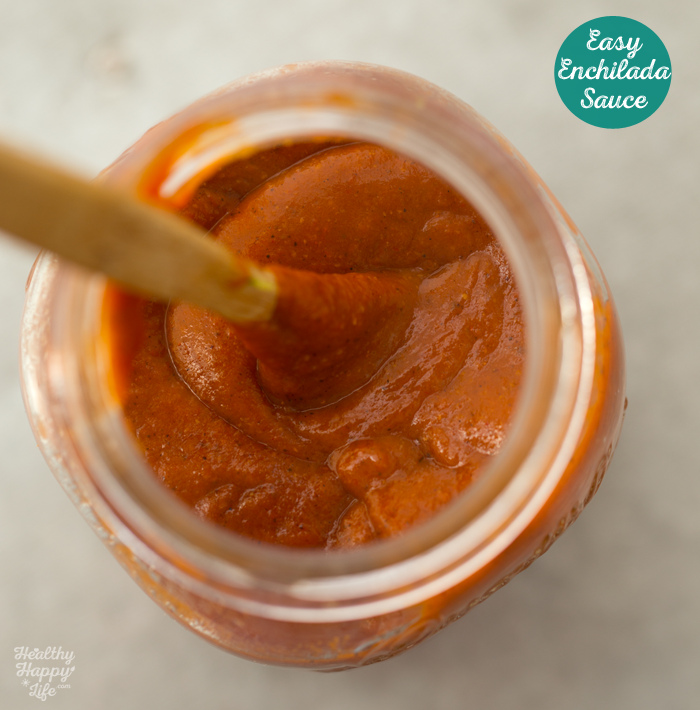 A few days ago I shared my super easy and delicious homemade enchilada sauce recipe. 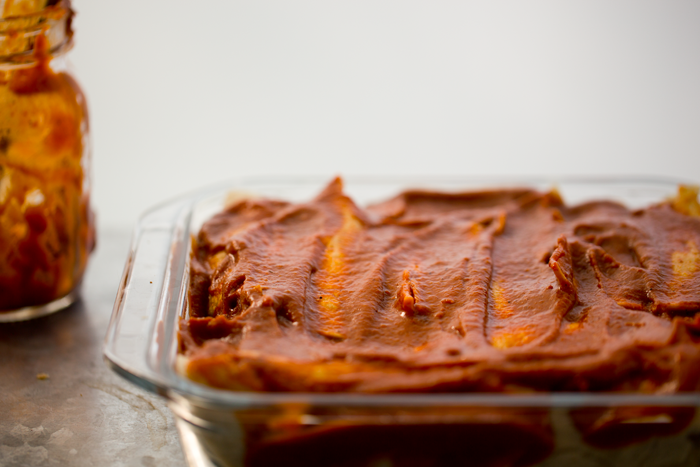 Well today, I share the enchilada recipe I used along with that yummy sauce. 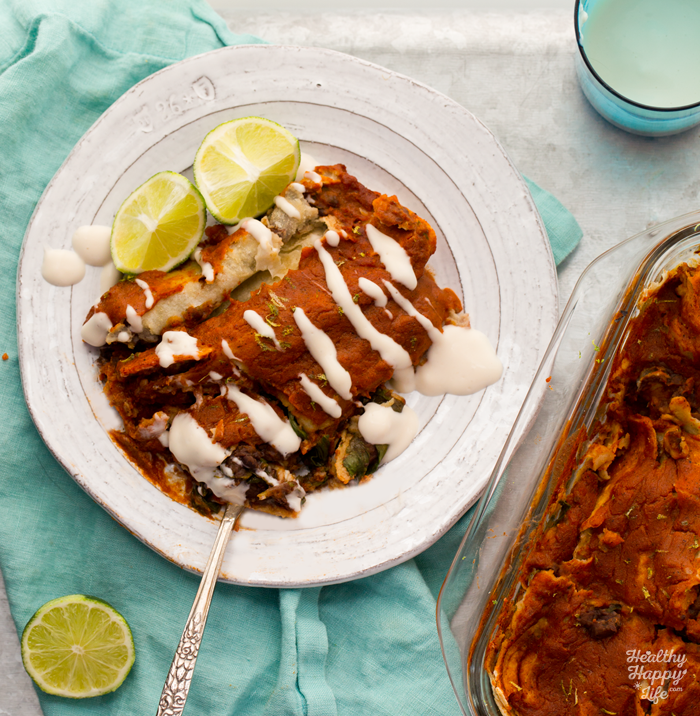 My Easy Black Bean Spinach Smoky Chipotle Enchiladas with Lime Cream.. 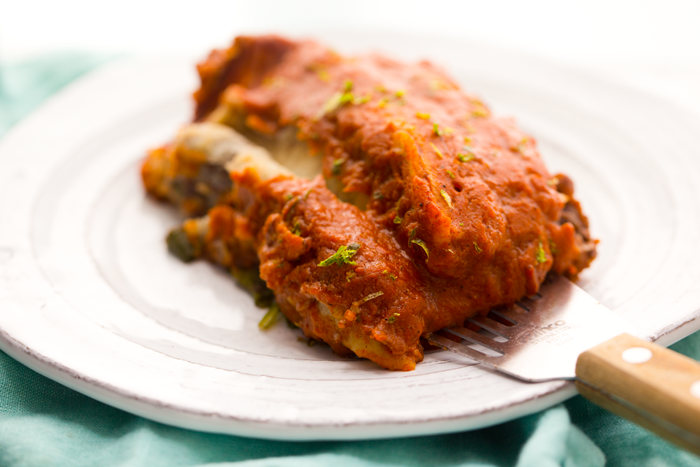 This meal is so comforting, warming, and nurturing from the inside out! Steamy, aromatic enchiladas pulled from the oven are a special treat. 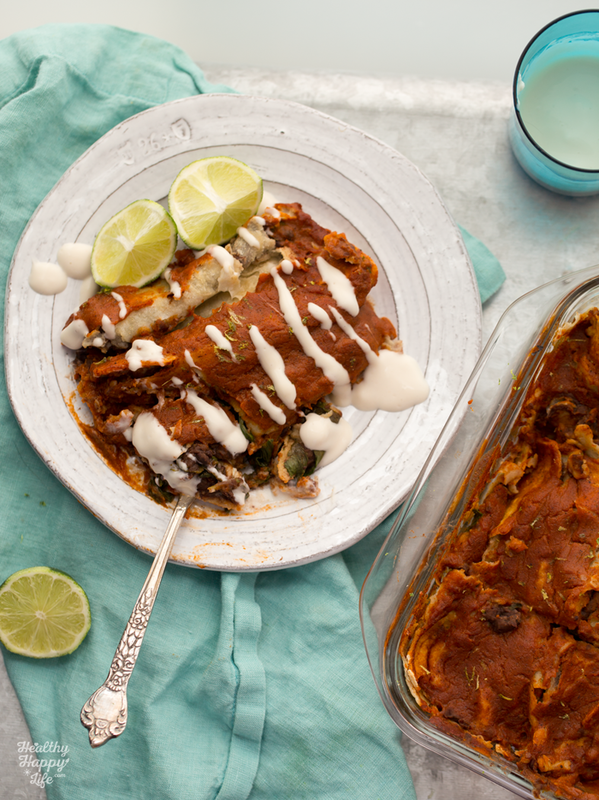 If you have not made enchiladas in a while, here is your inspiration to do so! This vegan recipe is incredibly healthy too. 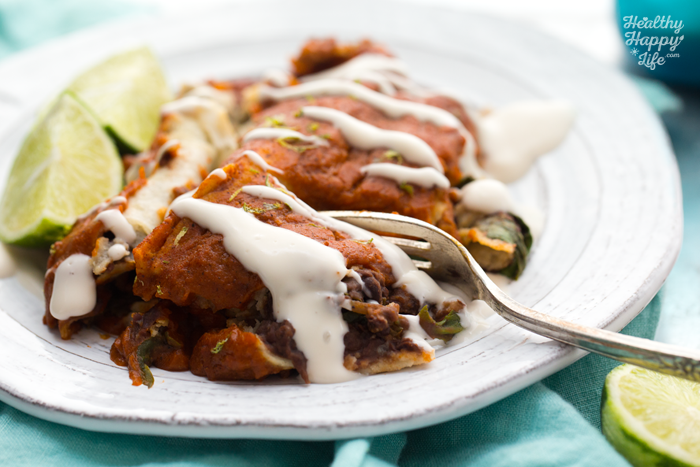 So often we assume enchiladas have to be covered in dairy cheese and rich, heavy sauces with rich high-fat, meaty or cheesy fillings. Nope. Not today! 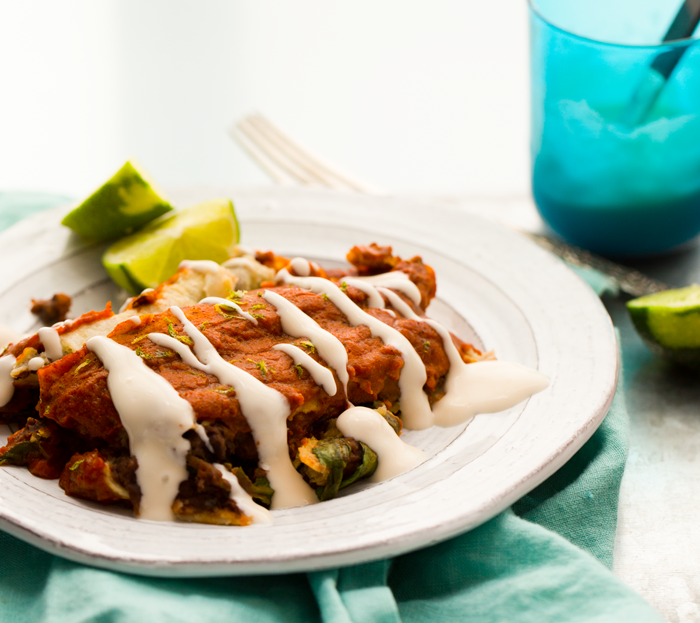 Dive into this special any-day meal!.. And ps. the leftovers are ah-mazing. 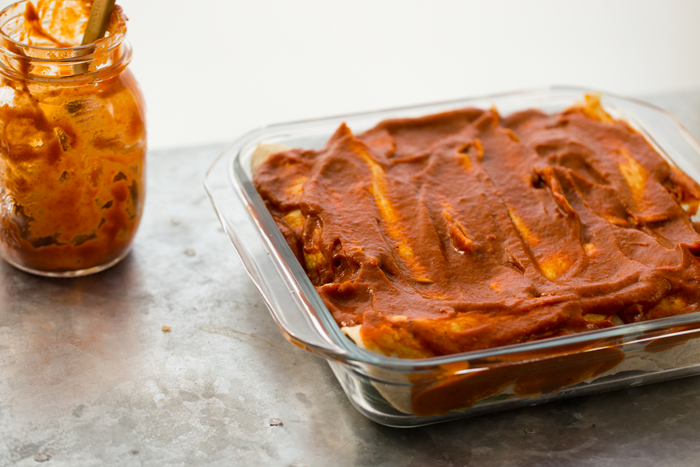 We start with homemade sauce - it is super easy to make! Pack them in, they do not need to be perfect!.. I like lime zest and/or cilantro on top to serve.. 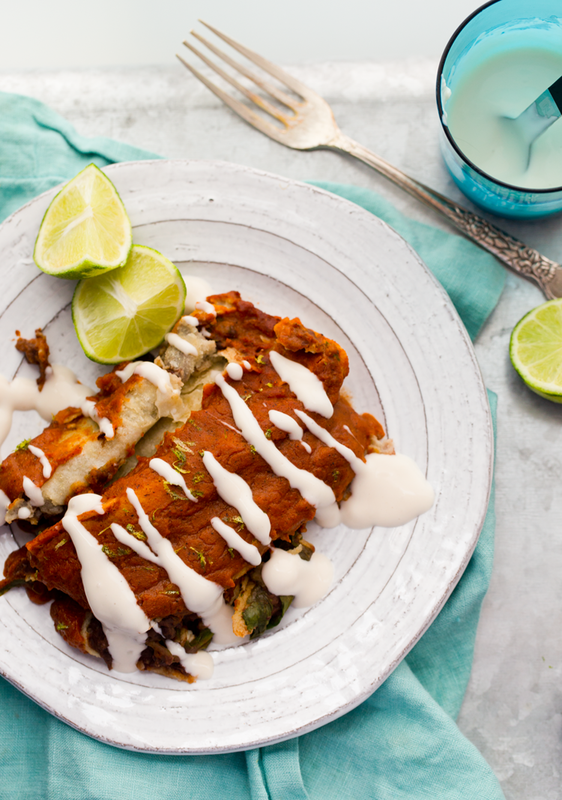 These easy and amazing vegan enchiladas are steamy, spicy and filled with flavor. Plus black beans and loads of leafy greens pack a nutrition punch! 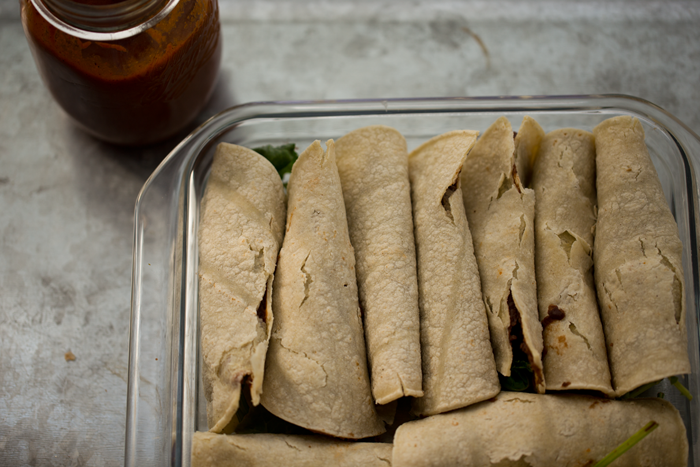 spinach + kale - as much as you can stuff into the tortillas! Preheat oven to 350 degrees. Lightly oil a 9" square casserole dish with extra virgin olive oil. First make the enchilada sauce. Recipe here. Warm a large soup pot over high heat and add 2 Tbsp water to the bottom. Place your greens in a veggie steamer and steam the veggies until the greens are lightly wilted. This helps when adding the greens to the inside of the tortillas. You could also lightly saute the greens in an oiled or watered skillet. 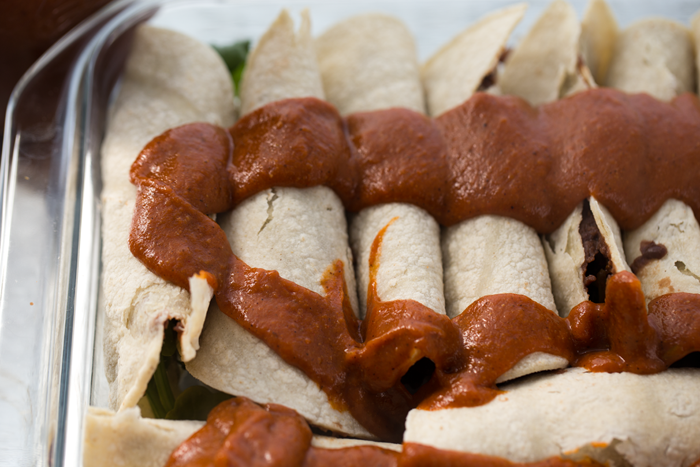 Start filling those tortillas! 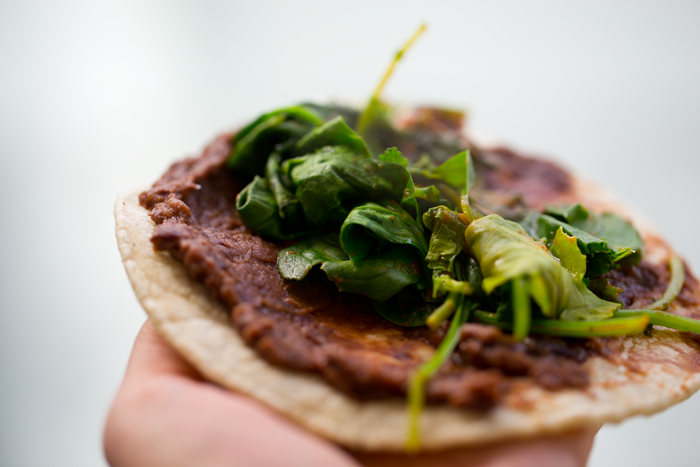 Add 1 Tbsp beans or refried beans to each tortilla and a handful of greens. Tip: If using whole black beans, you might want to smash the beans for easier application to the tortillas. Continue filling the tortiillas and placing, rolled up, in the casserole dish. 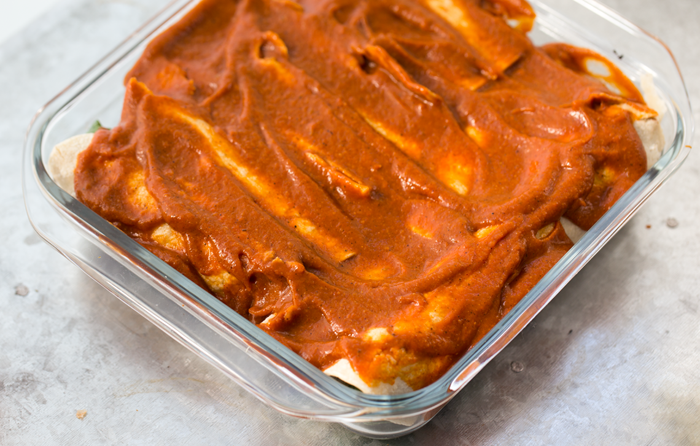 Pour the enchilada sauce over top the tortillas and smother every crevice. 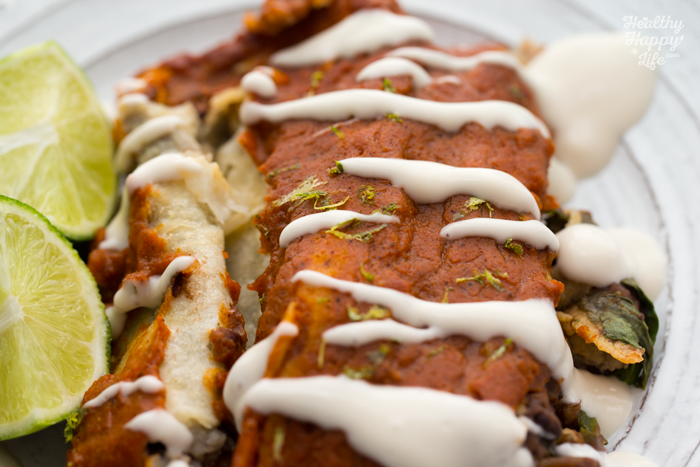 Spray a piece of foil with oil and cover the enchiladas with the foil, oil side down. 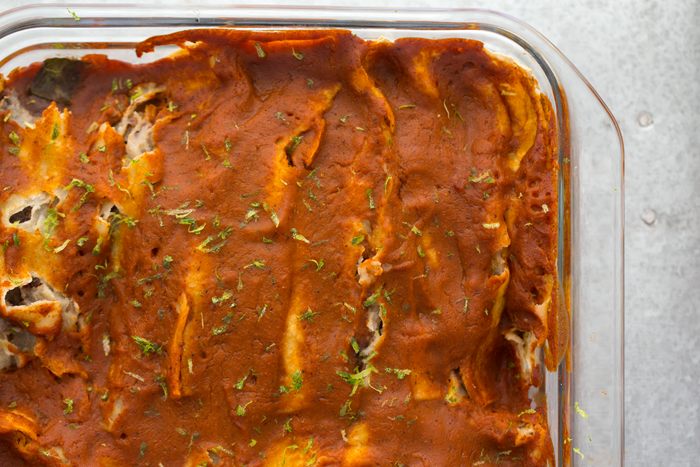 Bake enchiladas for 25-30 minutes, or until tender. 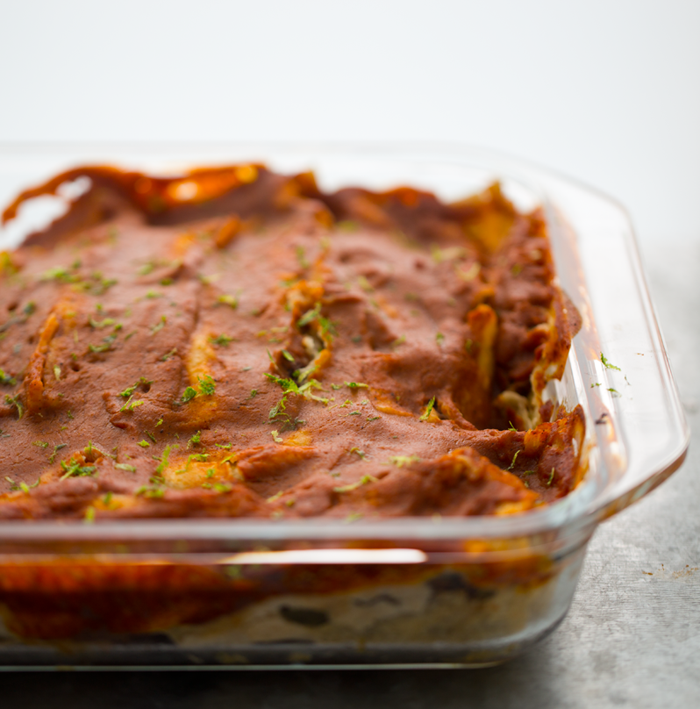 Allow to cool 10-15 minutes before serving. 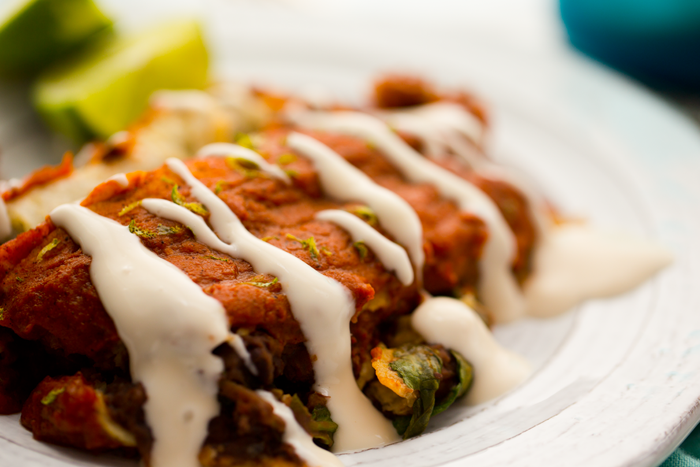 Serve with the lime cream drizzled over top. (Make lime cream simple by whipping lime juice with the vegan mayo!) -- Store leftovers, covered, in the fridge for up to four days. 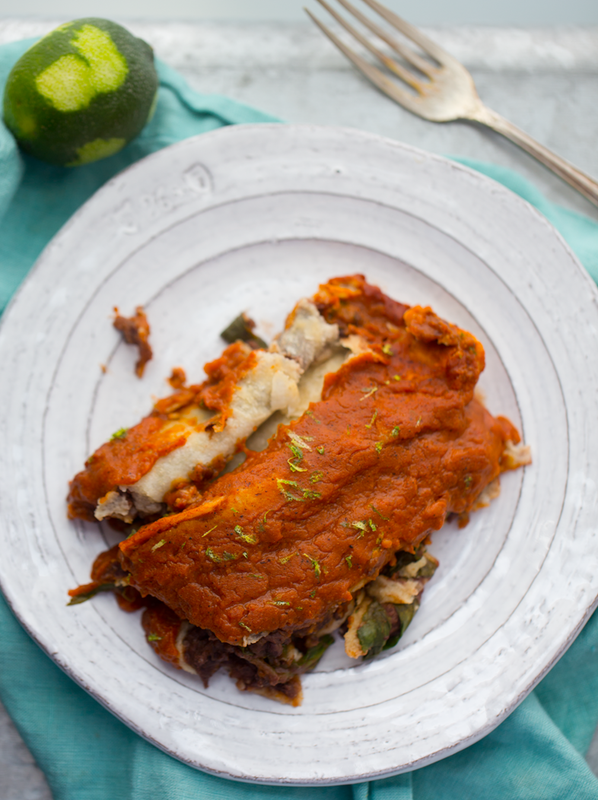 These are even more delicious as leftovers the next day, in my opinion!